Immediately, there is suspicion here, because Issue 2 had nothing to do with the Ohio Constitution. If you go to www.ohioact.org, you are redirected to an activist group called Food and Water Watch. This group obviously has nothing to do with government employee union laws in Ohio. So, who created the domain www.ohioact.org, set it up to redirect to Food and Water Watch, and is paying for it to be advertised online under the guise of Ohio Issue 2, an issue long since decided? A fellow named Ben Schumin. Ben doesn’t live in Ohio, and apparently never has. Ben works for, guess who?…Food and Water Watch. I wonder if his employer knows he is putting up false ads around the country to redirect people to his pet causes. Remember the crowds of Occupier thugs wearing black, with their faces covered, roaming the streets destroying store fronts, looting and burning private property? That’s what “black bloc” is. 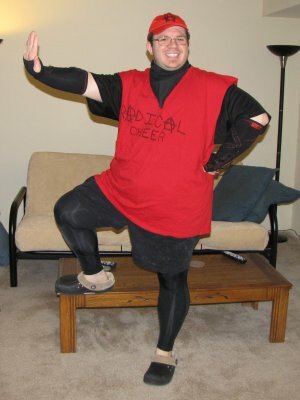 The picture above shows Ben in his “radical cheerleader” outfit. Ummm…yeah. Why is Ben associating his employer and his radical causes with Ohio and Issue 2? Definitely some strange people out there, folks. http://www.ballotpedia.org/wiki/index.php/Ohio_Livestock_Care_Standards,_Issue_2_%282009%29, and this is why we set up the website www.ohioact.org. As office manager, Ben Schuman coordinates administrative efforts like signing up for web domains. His personal political views are his alone and not shared by Food & Water Watch. Well, that certainly makes the ad make sense. Maybe you guys want to stop running ads about an issue that was decided 2 1/2 years ago, though. Seems like a waste of your donors’ money to me.